In the Bible, God uses various pictures to describe "SIN". We will be adding much more detail to this study later. Here are just some ways of viewing "sin". Sin is a spiritual disease (toxin) that soils our pure hearts, dims/veils our eyes and prevents us from seeing and experiencing the abundant life God has planned for us. It began with Satan (the devil) and his demons and has spread to every human being. The devil lied to Adam and Eve about God's intentions and they believed the lie. As our first parents, they allowed this disease to enter all of us. A sinful lifestyle is rooted in a life lived outside the presence of God. Thus, whever we choose "distance from God" instead of "closeness to God" we feed this toxic lifestyle. God desires to be close to us just like a loving parent desires to be close to her children. This desire of God to be close to us did not start in the New Testament with Jesus. 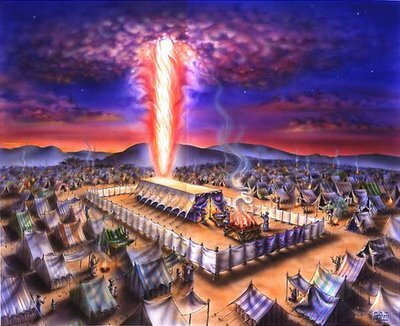 Look at this picture, from the Book of Numbers in the Old Testament. This represents a picture of God's presence amongst His beloved people, the Nation of Israel. He wanted SO MUCH to dwell with them that he even had them put their tents all around his house! He could have told them that they had to travel to the next mountain to spend time with Him, but that's not what He did! A sinful lifestyle begins with believing and embracing lies from Satan about our true identity. The second lie is that God can't be trusted and that we need to seek our own worth apart from him. The truth is that God designed us to live in community with Him and with others. God himself lives in community with Jesus and with the Spirit of Holiness. He designed us IN HIS IMAGE. (See Genesis:1:26,27). Thus, we are social beings. Planting seeds of distrust and finding ways to isolate us from God and others are tools of Satan, who wants to take away all our protection and torture us! These lies are the invisible toxins that, when clung to, transform themselves into a wall that forms around our spiritual hearts and makes it difficult for us to see God's essence, feel God's love and be filled with his very presence . When we stop believing that we were created to be filled with God and loved by Him, we find other things to fill that God-shaped void in our lives. We develop toxic attitudes that gradually create more decay in our inner souls. See Romans 1: 18 - 2:16, 1 Timothy 3:2-9. These toxic attitudes mature into sinful actions. The best way to describe these actions is ABUSE. We abuse ourselves and others. This creates an endless cycle of violence, pain and hurt. We even a buse God with our disrespect for his values and our abuse of his other children, as well as our abuse of our own lives. All of this continues to snuff out the truth of who God is. This is the very truth that we were meant to declare by our very lives! We contribute to the distortion of God's image. No wonder our world is a mess. God's greatest desire is to heal us from the lies of Satan and this "sin" disease. He wants to free us to know Him for who He really is so that we can have a healthy relationship with Him, others, and even our own self. Jesus volunteered to come to earth to open our eyes and bring this healing to us. Soon there will be additional information about the topic of sin and how to be freed from its slavery.